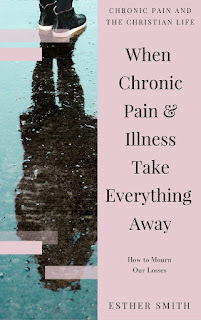 I am pleased to have Esther Smith joining me today to talk about her new book, When Chronic Pain and Illness Take Everything Away. 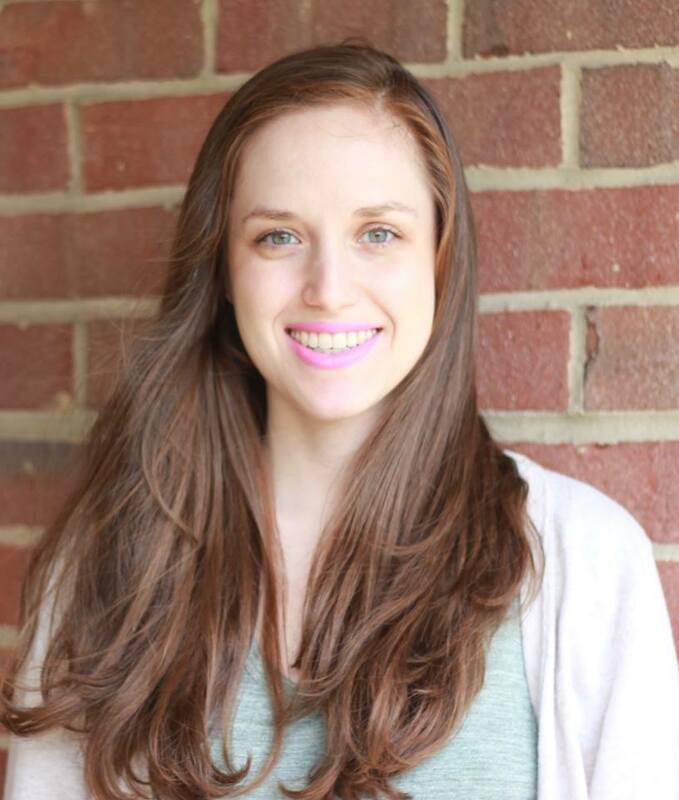 Esther is a blogger at lifeinslowmotionblog.com, where she writes about faith and chronic pain and illness. Her blog, and her books, have encouraged me in my life with a chronic illness. I hope you will be encouraged by her too! Thank you so much for joining us today, Esther! Hi Rachel, thanks so much for having me! 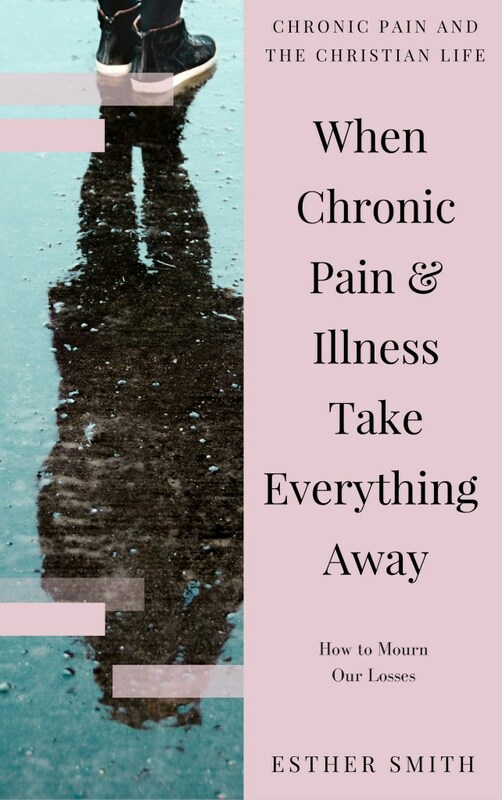 How does chronic illness and pain affect you? In a nutshell, my chronic pain affects my ability to stand, walk, and sit for long periods of time. When this first started to happen, I tried to push through and continue with my daily activities. But I quickly learned this strategy caused my condition to sharply regress. I had to learn how to rest and live my life without the unlimited movement I was used to. It’s hard to explain how much physical limitations such as this affect every single area of life. I have to be so careful as I decide what commitments to take on, knowing my body can only handle being upright for a limited number of hours each day. This has placed significant limits on my ability to work, socialize, serve, play, and do regular chores around the house. Just this past weekend, I tried to make it to a women’s event at church. I lasted a half hour and had to come home because I knew if I stayed it would affect my ability to go to work next week. Every day I have to make choices like this about what is most important, and in the process, so many wonderful things in life get pushed to the side. What made you decide to write When Chronic Pain and Illness Take Everything Away? I wrote this booklet because the physical limitations I described above lead to a lot of emotional pain and distress. They lead to a lot of questions and doubts and confusion. For me, it was confusing to see ways in which God had gifted me, and then feel unable to use these gifts. It also didn’t make sense that God would take away things he says are important – things such as being in community, serving others, and enjoying his creation. 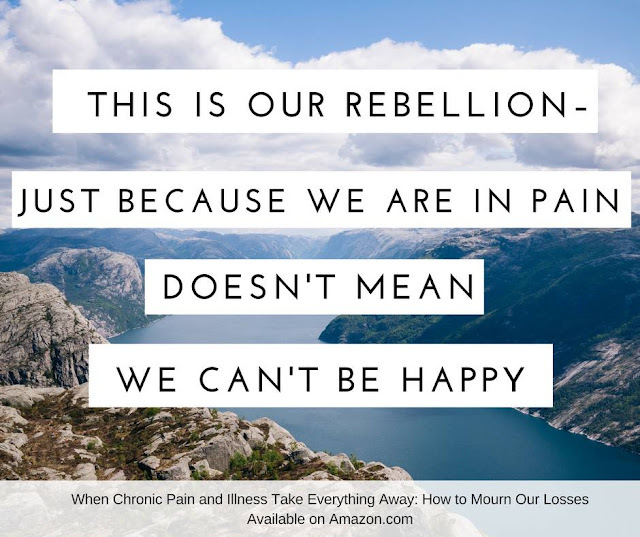 I wrote this book because the losses of chronic pain hit me hard. And not just me. My friends with chronic pain and illness were experiencing the same things. I was struggling to know how to approach God and accept God’s will for my life in the midst of my losses. Writing through this helped me gain some understanding of what I was experiencing and how to move forward. And I hoped that what I was learning about grief would help other people in the process as well. Grief is not an easy topic to read about. I wondered if people would be interested in a book about grief. But, in my heart, I knew it was such an important topic. And when people were ready to approach their grief, I wanted them to have a resource that would help them do so. What is one thing that has helped you to deal with the grief that comes with chronic pain and illness? In seasons of grief, I always find myself writing. Sometimes I journal. Sometimes I write a blog post. At one point, grief led me to write this booklet. Sometimes I write for my eyes only. Other times I write directly to God as a prayer journal of sorts. And at times I write for other people to see so that we can share our grief together. Whatever form my writing takes, it has become a way for me to process everything I am thinking, feeling, and questioning. As I write, I begin to make better sense of life. All the grief that has been building up in my head and in my heart falls onto the piece of paper, leaving me to feel a little bit lighter. Writing allows me to approach my grief instead of pushing it away or ignoring it. I believe that anything that helps us move through the grief in this way is a positive thing, and over and over again, writing has done that for me. You mention in the book that Lamentations 3 is a chapter you turned to often in your grief. How did the words in this passage of Scripture help you? I think this chapter gave me permission to feel deep emotional pain. It gave me permission to feel hopelessness and desperation. It mirrored some of my deepest fears – that perhaps God was shutting out my prayers, and perhaps he had walled me in and abandoned me. While rationally I knew these things were not true, sometimes it still felt like this was happening. I also liked that Lamentations 3 held a few verses of hope. It didn’t end with hope; hope was found right in the middle of the passage, a brief reprieve from the darkness. At times my life has felt like that. I wrote in the booklet that Lamentations 3 gave me just enough hope that I could still believe it. Passages with too much hope felt like a lie; those with no hope tempted me to think all was lost. Lamentations gave me a balanced view of both – in this life we find both grief and hope intermingled together. What brings you joy in the midst of pain? I could answer this question in a lot of different ways. But, what I have been focusing on lately is finding joy in the little things God gives me. A conversation with a friend. A favorite food or beverage. Eating a piece of chocolate. Buying a new book. Going to church. Getting out of the house for a short trip somewhere. These things do bring me joy. It’s easy for me to focus on all the things that I can’t do, so lately I have been trying to focus on the things that are still possible. What advice do you have for someone who is considering self-publishing a book? My advice is that you should definitely go for it, but don’t rush the process. I worked on a full-length book about chronic pain for over a year. When I finished, a part of me just knew it wasn’t ready for publication. In the end I decided to take the best material from that book and repurpose it into several small booklets. I am so glad I didn’t publish that book and that I waited long enough to realize this was the right decision. I would have really regretted publishing material that wasn’t ready. Self-publishing can be too easy. It only takes a few minutes to submit your manuscript. So, my advice is to go for it, but to wait. Wait until you know without a shadow of doubt you will be proud of the finished product. Esther is giving away a copy of her book to a Cranberry Tea Time reader! The winner may choose either a paperback book or a Kindle version. To enter, please use the Rafflecopter form below. The winner will be notified next week by email.